I have the best job ever. I live in the great Pacific Northwest, I love animals, and I work at a wildlife rescue and rehab facility. How can life possibly get any better?! There is, however, a great need to educate people about the wild animals that live among us. I have come to find a majority of people just don’t understand the laws and/or behaviors concerning the wildlife that we see day in and day out. Part of my blogging mission is to educate people and to share wildlife stories, good or bad, with everyone so that they, too, will understand the laws and behaviors of some of our fabulous animal friends. …that crows live on the ground for 7 to 10 days while they are learning to fly? Please leave them alone. …that you can tell a crow is a fledgling because it has blue eyes? …that mama birds will NOT reject their babies if handled by humans? This is a huge myth; their sense of smell is not that good. …that mama deer leave their fawns to sit alone for hours at a time while mom goes off to forage for food? Just because you don’t see mom doesn’t mean the fawn is an orphan. …that ducks will not accept other babies as their own? Ducks are very territorial and will kill other ducks that come near them, including babies. …that it is illegal to trap and relocate wildlife? …that it is illegal to rehab and release any wildlife in the state of Washington if you are not licensed and permitted by the Department of Fish and Wildlife? I spend multiple hours on the phone, day after day, week after week, informing people of what’s right and what’s not when it comes to wildlife. If I can save that one cute little raccoon from being imprinted by humans and then ultimately euthanized because it doesn’t know how to hunt for food, then I have done my job. Please let our wildlife stay wild as nature intended! 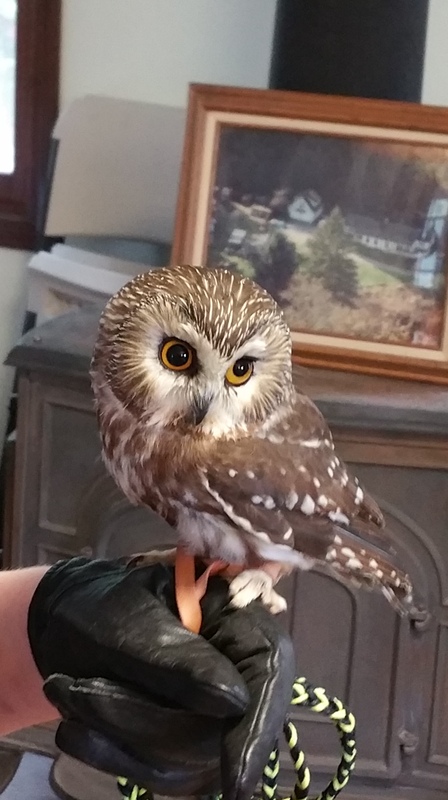 A nonreleasable Northern Saw-Whet Owl that was hit by a car and now has permanent eye damage. This entry was posted in Wildlife and tagged education, Pacific Northwest, rescue and rehab, wildlife on July 11, 2015 by Paula. Thanks for all that cool info about birds and animals. I didn’t know any of it 🙂 I must now click the follow button – can’t miss your wildlife wisdom. Oh fabulous! That is so nice to know!! Thank you! !